Camera hole, square credit card reader bracket, and exposed home button. 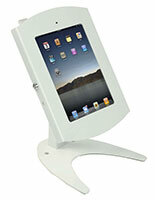 This iPad desktop stand is designed primarily for business use. 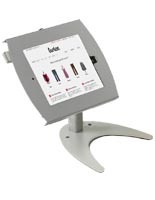 Retail stores often use these Apple® tablet holders at sample stations or "try me" areas with new applications. Each iPad desktop stand is like getting two displays in one. The enclosure can be used with or without the pedestal, and the mount is VESA compatible for 75mm x 75mm and 100mm x 100mm. 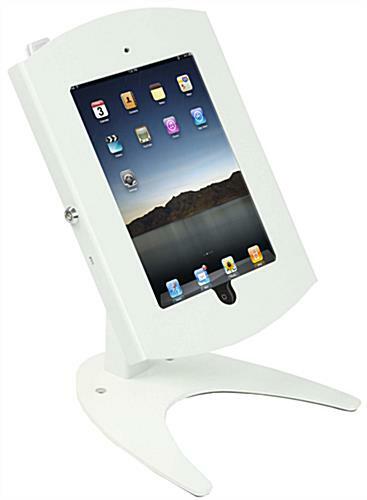 The versatility of the tablet desktop stand allows users to interchange the device with a monitor, LCD, or even a digital picture frame. 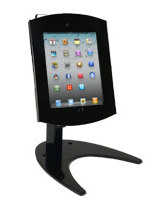 Business owners love the flexibility that comes with this steel desk holder. 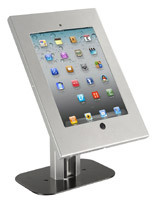 Each desktop stand for touchscreens, called an Apple® countertop kiosk, easily rotates from portrait to landscape format. No tools are needed for changing the viewing orientation. This iPad desktop stand has rubber padding on the bottom to prevent the desk from getting scratched. The padding also keeps the unit from sliding around on countertops. 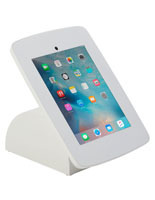 Each Apple® tablet desk holder is an desktop stand that locks the touch screen player inside the enclosure for security in public. Please Note: This product is designed specifically to hold Apple 2nd and 3rd. We cannot guarantee that this will fit other tablets.